Bake 15 to 17 minutes or until golden brown. Heat remaining 1/2 cup marinara sauce; serve with warm calzones. For easier eating, chop up the pepperoni before stirring it into the sausage mixture. If you don’t have fresh basil, use a generous spoonful of dried Italian herb seasoning or crushed rosemary leaves. Set up a DIY filling buffet for the kids, so they can make their own pizza pockets. You’ll need to double the recipe so there’s enough dough (depending on the head count). You can also divide the dough into smaller portions and let them press, stretch, or roll out the dough themselves. Stress that they should use just small spoonfuls of their favorite ingredients so the calzone won’t explode in the oven. Line flat baking sheets with baking parchment for easy clean up. What could be better than handheld pizza with minimal mess? The calzone, like its Italian cousin pizza, originated in Naples, Italy during the 18th century. Its name translates to “pant leg” or “trouser” in Italian. Calzones made it easy for working people to grab a bite to eat without having to sit down with a knife and a fork. The original calzones were made by folding an uncooked pizza—topped with ingredients like ricotta cheese, mozzarella, anchovies and olives—in half before baking it. There are plenty more filling options for calzones—choose your favorite pizza toppings and you’re only 35 minutes away from dinner. This cheesy pork sausage-loaded calzone preps in just 15 minutes and makes 4 servings, perfect for sharing with your family. 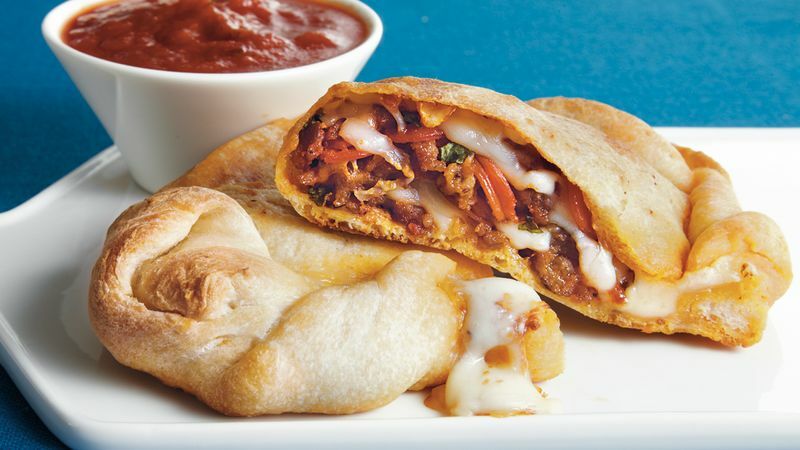 From mini football calzones to lasagna-filled, there’s a calzone (or two!) for your next meal in our list of best calzone recipes. Ever wonder how long leftover pizza lasts? We’ve got the answer in our how to make pizza guide.